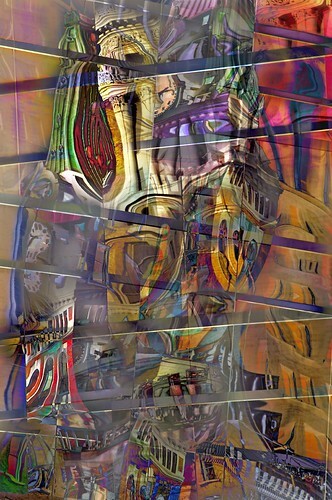 Tower of Babel, Photoshop collage by Harold Davis. View this image larger. 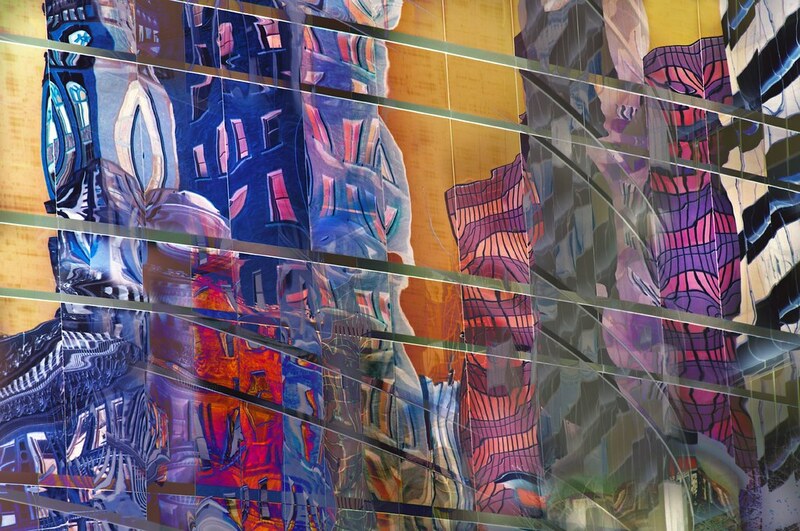 This is a Photoshop collage based on Persistence of Reflections and More Oakland Reflections. I think it is best viewed at a larger size. Like my first collage based on the Oakland reflections, Civilization, the collage is of the two images combined. I separated each into component color channels in LAB and RGB color spaces, selectively inverted and equalized the channels, and combined using layer masks and a variety of blending modes (primarily Multiply, Overlay, Soft Light, Color, and Luminosity). 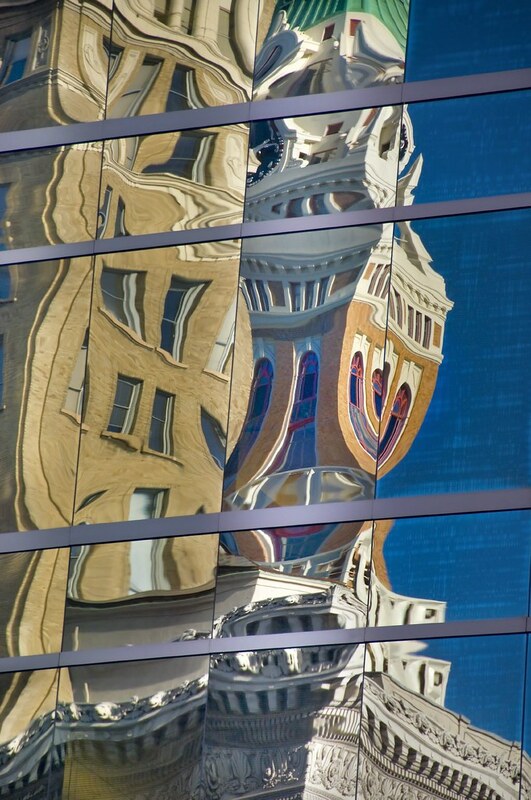 Oakland Reflections II, photo by Harold Davis. View this image larger. 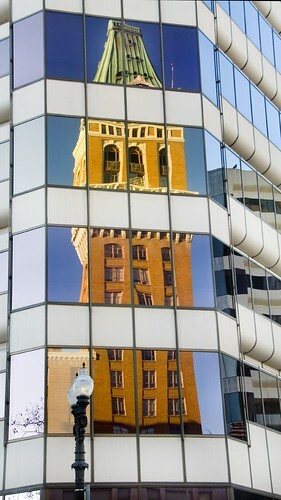 Here’s another photo in my series of reflections from downtown Oakland. 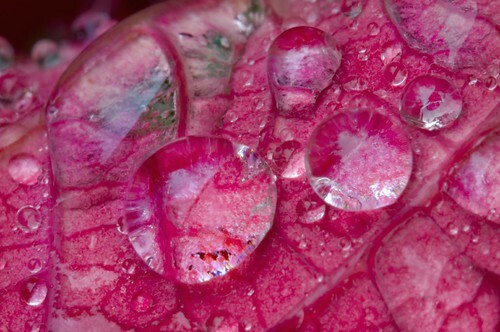 Rain Drops on Poinsetta, photo by Harold Davis. View this image larger. The other day it was raining, but bright. 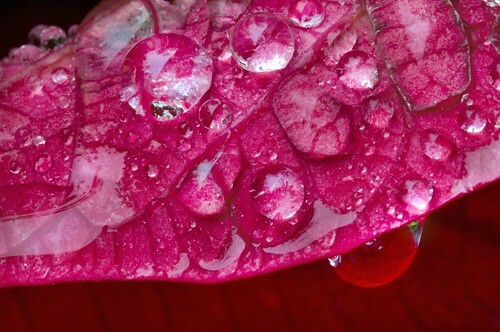 I snapped these photos of rain drops on the poinsetta on our front porch. Amazing, the way rain drops just look different in their dispersal patterns and the shape of the drops than water drops generated in other ways. Perhaps it is the distribution of many sizes of drops, the shape of the drops, the chemistry of rain, or something else. All I know is that drops of rain are pleasing in a way that drops of water from a hose, and irrigation system, or a spray bottle just aren’t. 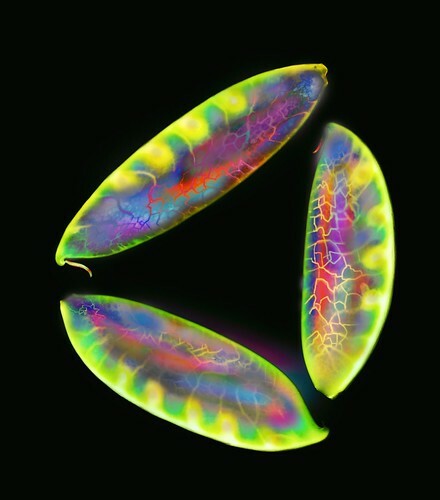 Intelligent design patterns, indeed! 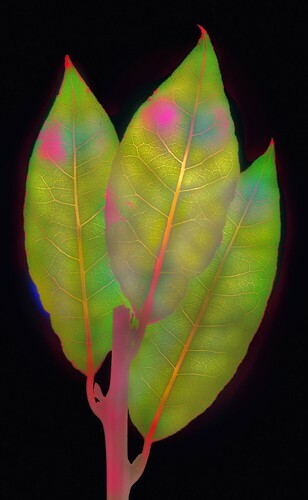 Bay Leaves, photo by Harold Davis. View this image larger. With this photogram of bay leaves, I wish you and yours a taste-filled and happy New Year! Snow Peas on Black, photo by Harold Davis. View this image larger. 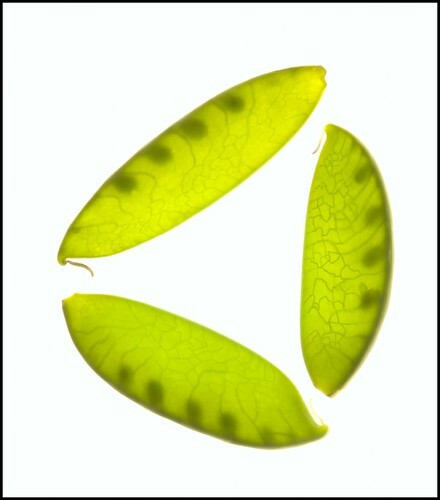 These snow peas started on white (below) and ended up manipulated for effect on black (above). Shitake Mushrooms, photo by Harold Davis. View this image larger. 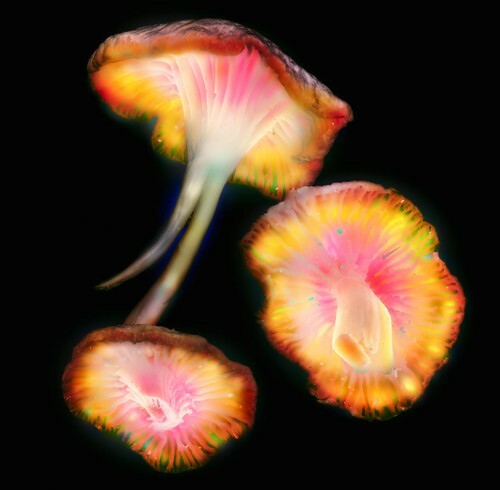 I blasted light through these shitake mushrooms, photographed the group from above. In Photoshop, I inverted the photo to get it on black, and then cross-processed the heck out of the composition. Star Anise, photo by Harold Davis. View this image larger. Star anise is a spice used in Chinese, Indian, and Vietnamese cooking. The star anise is the fruit of the Illicium verum, a fir tree native to southwestern China. 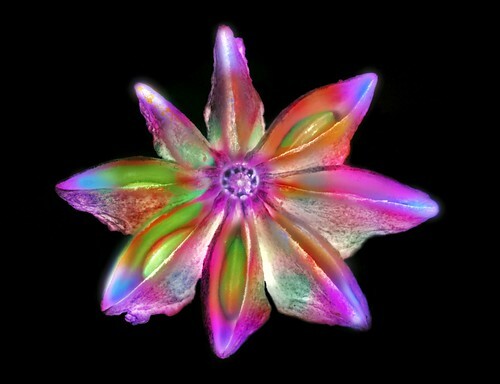 In the seven-pointed star anise shown in this photogram, you can see the fruit seeds nestling in a couple of the spokes of the star. Civilization, photo by Harold Davis. View this image larger. 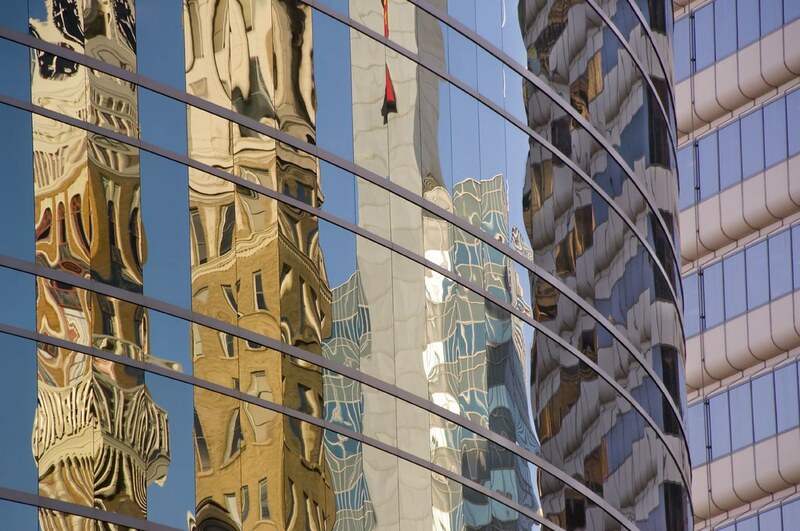 This is a Photoshop collage based on my Oakland reflections photos. 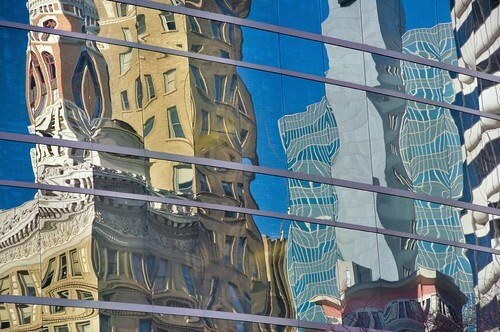 Related stories: There Is a There There; Persistence of Reflections; Reflections, Downtown Oakland. Forgotten in the mythology of Oakland–the high violent crime rate, and the barrios that gave birth to the Black Panthers–is the fact that this is a thriving city. San Francisco, across the Bay, casts a long shadow. It’s hard to compete with a sibling so graceful and talented. It’s also hard to overcome Gertrude Stein’s pithy epigram about the lack of a there being there. Oakland is one of the largest West coast ports, engorged on the China trade. The hilltown suburbs of Piedmont and Montclair are among California’s wealthiest. Oakland’s Chinatown is extensive and authentic, without t-shirts for sale, tourists hardly in sight. And, as these photos show, downtown Oakland presents great architectural variety, with baroque 1920s skyscrapers reflected in the curved, mirrored glass of modern office towers. I had a great time photographing these reflections. The moral for me: don’t pass up photographic subjects just because they are local (this moral comes up often). Sometimes the supposedly less glamorous subject has more glamour than that which at first sight seems to dominate the glamour field. 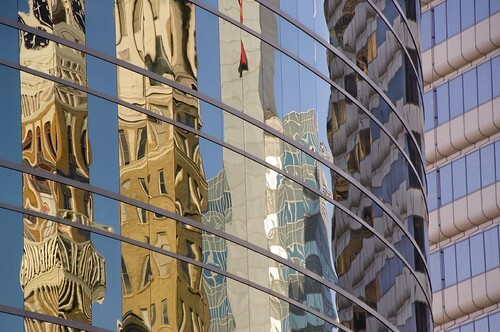 Related Stories: Reflections, Downtown Oakland; Persistence of Reflections. 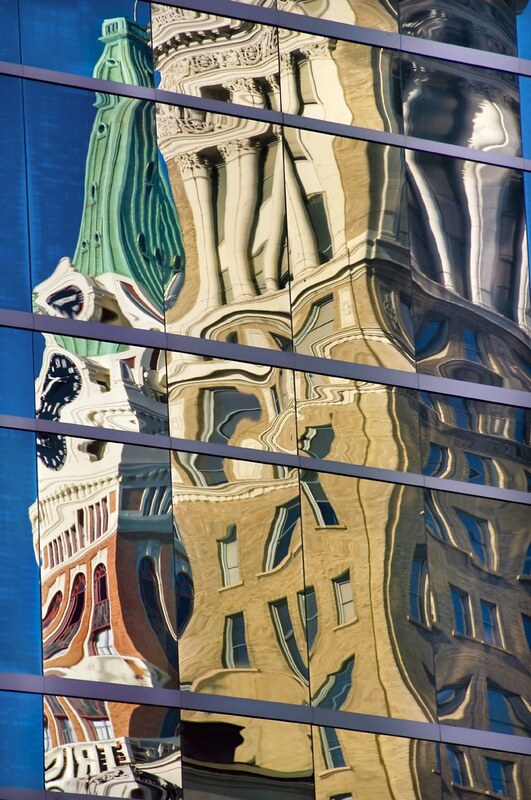 Persistence of Reflections, photo by Harold Davis. View this image larger. The reflections in downtown Oakland, as I’ve said, remind me of architecture by Gaudí. Close up, looking at the reflection of the clock, we move from Gaudí to Dali, particularly his famous painting with floppy time pieces, The Persistence of Memory. Reflections, Downtown Oakland, photo by Harold Davis. View this image larger. Mark and I wandered downtown Oakland with our cameras, and we were struck by these reflections in the curved glass of an office building on Broadway. They looked to me like something constructed by Gaudí, or maybe Dr. Seuss. 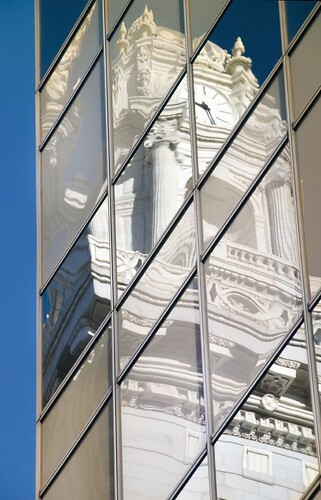 I used a polarizing filter to amplify the clarity of the reflections. Normally, I’d use a tripod to get a shot like this with sufficient clarity. But I’ve found very little noise with my new D300. So instead of stabilizing with my tripod, I boosted the ISO to 500 to get a fast enough shutter speed so the resulting photo would be sharp handheld. Don’t get me wrong: I advocate using a tripod, and use one a great deal of the time. Still, it was nice to be able to find the right angle without having to worry about positioning my three-legged friend. And I think you’ll agree that there’s basically no noise in the final image. 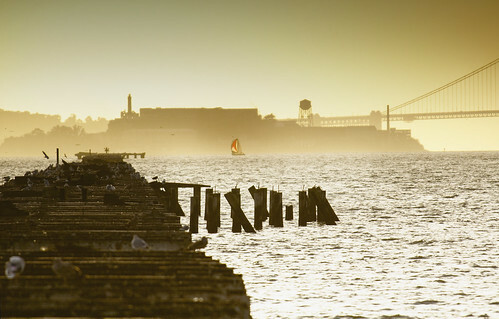 One purpose of the Oakland exploration yesterday was to test my FindMeSpot. This is a personal GPS device that connects to a low-orbit satellite, and can be used to pinpoint my location. The idea is that I can send out an email or text message to designated recipients saying I’m OK, or that I need help. The email message includes a link to my coordinates, placed on a Google map. This device can also be used to call 911 for search and rescue. Theoretically, this GPS device could be a life saver, for example, if I get lost in the desert at night again. The device does need to be able to see the open sky to work. In my tests, an “I’m OK” email works fine, and makes it to the designated recipients with my position. But in downtown Oakland, and by the harbor, we were testing a tracking mode that is supposed to continuously record one’s position (and note it once every ten minutes). This “spot casting” mode (which costs extra) doesn’t seem to work very well, alas. Mathew, photo by Harold Davis. I guess opening presents is hard work! 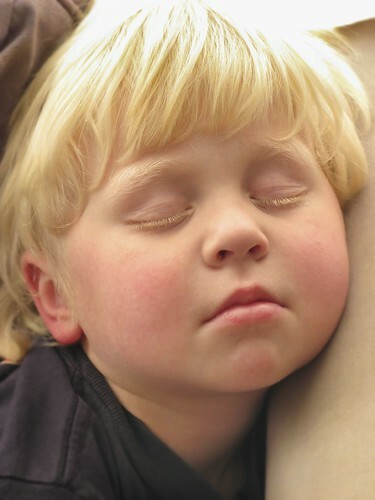 When our Mathew is asleep, it’s possible to forget the often joyous and always loud being that inhabits this three-year-old body. 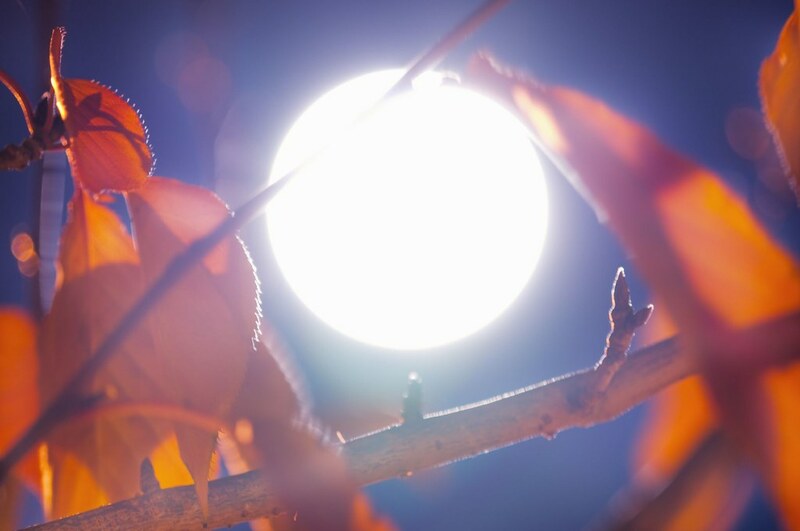 Winter Moon and Cherry Leaves, photo by Harold Davis. View this image larger. Christmas eve we had lots of family over, a turkey dinner, and the table groaned. Later, after almost everyone had gone home, and it was time to get the kids to bed, I saw the winter moon rising over the hills. I took a fancy to photographing the rising moon through the leaves of our decorative Japanese cherry tree. Satiated with food and with my mind on family I was almost going to pass on it. But every time I haven’t tried for a photo that took my fancy, I’ve regretted it. I packed my kit and went outside with Julian while Phyllis got Nicky and Mathew to bed. With Julian giving me advice, I started shooting the moon through the winter leaves of the decorative cherry tree (I planted it about the time Julian was born). I boosted the ISO up to 3,200 for my first shots, focused at infinity for the moon, and hoped for the extreme low noise that I’ve been getting with my new D300. But the best image in the series turned out to be this, shot conventionally at ISO 100 and 15 seconds, and focused on the branch of the tree. Focusing closer at a wide-open aperture made the moon–which was going to blow out highlights completely if I retained any foreground detail–huge, abstract, and round. Sailboat, photo by Harold Davis. I took this photo from the end of the Berkeley Pier several years ago. Looking through my files recently, I was struck by the contrast between the colorful sailboat and everything else. Red Rose Heart, photo by Harold Davis. View this image larger. 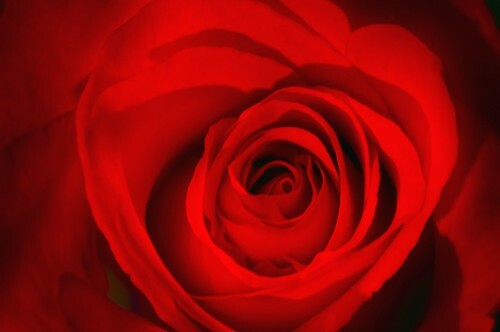 The interior of this red rose reminds me of the conventional shape assigned a heart.